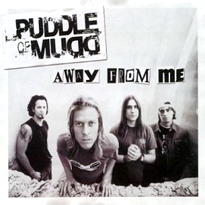 "Away from Me" is the lead single from Puddle of Mudd's Life on Display album. Wes Scantlin mentioned in an interview with VH1 that "Away from Me" was written about how he was lied to and deceived in a relationship. A music video was created for the song, and can be found on the Life on Display CD when inserted into a computer's CD drive. The song is also one of Puddle of Mudd's most successful songs, charting the highest of any song on the Life on Display album. It hit #1 on the Mainstream Rock Tracks chart, where it stayed for three weeks, in addition to reaching #5 on the Modern Rock Tracks chart, and #72 on the Billboard Hot 100. It was featured in an episode of The O.C. in 2004. ^ a b c "Puddle of Mudd Artist Chart History". Billboard. Retrieved 2008-11-29. This 2000s rock song-related article is a stub. You can help Wikipedia by expanding it. This page was last edited on 30 December 2018, at 12:42 (UTC).